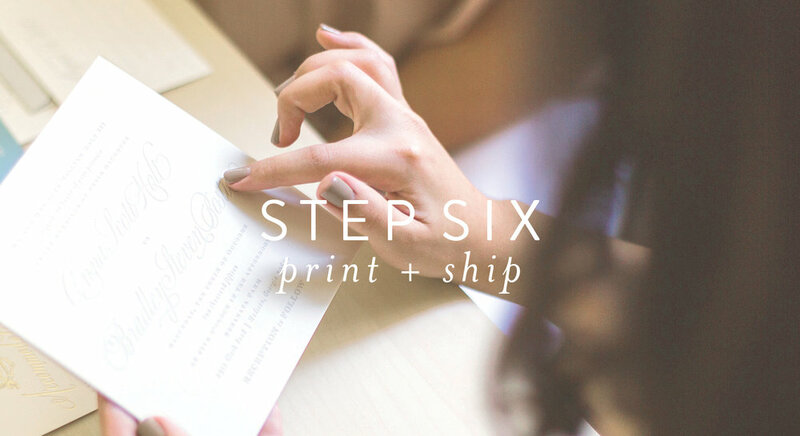 Your wedding paper is the first impression your guests have of the most important day of your life. a cohesive paper suite is everything! To get started, read below about our process and typical timeline. We do take custom clients based on our schedule, and can only have a limited number at a time. To check availability, please click contact at the top of the page and fill out the form provided. We will take it from there! We need to know the details! you back within 2 to 3 days! or will be in the area, we'll schedule a meeting at our studio to drink some coffee, look at samples and discuss your suite! We are also available for phone chats if you aren't close by. we will mail samples if necessary, and we will email you booking instructions. your spot on our schedule, so you can cross one thing off your list! Once your booking is complete, we will look over your order and send an invoice for half of your total. This payment covers my design time, as well as envelopes so you can begin the addressing process. Design time differs from client to client, but to get an overall idea of a timeframe, check out our design timeline! four to six options of your invitation. the rest of your suite for a cohesive look. is about a two day process, while letterpress and foil can be up to three weeks. your suite and ship to you to start the stuffing and mailing process!